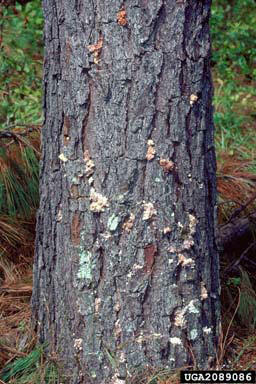 Importance: Attacks from black turpentine beetle (Dendroctonus terebrans) are observed on all pines native to the South. It is most serious in pine naval stores and pines stressed by serious drought, flooding, storms, wildfires, and cutting operations. Use of mechanized harvesting equipment, which damages residual trees, compact the soil and injure the roots, has increased damage by black turpentine beetle. Identification: The adult beetle is1/4 to 3/8 inch long and dark brown or black. This beetle may be confused with Ips bark beetles, but is larger, more heavily bodied, and does not have a scooped out posterior. Creamy white larvae are very small with a reddish-brown head, and are approximately 1/3 inch long. The yellowish-white pupae are about ¼ inch in length. Signs of Attack: The most obvious sign of attack is pitch tubes on the lower trunk and stumps, usually on the lower three to eight feet of the tree. Tubes are large--sometimes about the size of a walnut -- and white to reddish. Older tubes have a sugar-like texture. Foliage color is not a satisfactory indicator, since large infestations may develop before any trees are killed or foliage turns brown. Life Cycle: Adult beetles are attracted to injured or weakened trees and fresh stumps. They bore into the cambium layer and excavate a broad vertical gallery kept clean of boring dust. Eggs are laid in clusters along the gallery. After hatching, larvae feed side by side, destroying large patches of the cambium area. No individual larvae feeding galleries are present, as with Ips beetles. When enough larvae are present, they girdle the cambium causing death. After pupation occurs between the bark and the wood, adult beetles emerge and seek new host trees. Two or four generations a year may be produced in Alabama. Control: Build up of this insect is comparatively slow and, if stands are watched carefully, many attacks can be headed off. Proper forest management practices regarding harvesting and naval store operations can reduce beetle attacks. In logging areas with active black turpentine beetle infestations, fresh stumps should be sprayed with an insecticide. Salvage cutting trees will also reduce additional losses. Spraying trees that have been attacked is usually successful if infestation is light or if the trees are not too severely weakened. Spraying to prevent attacks on adjacent trees is also practical. 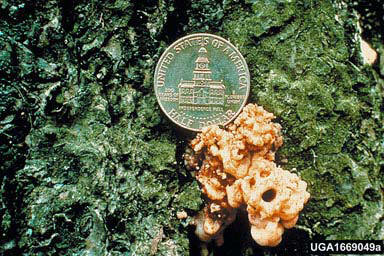 Contact a forester who is a certified pesticide applicator for specific chemical to use.